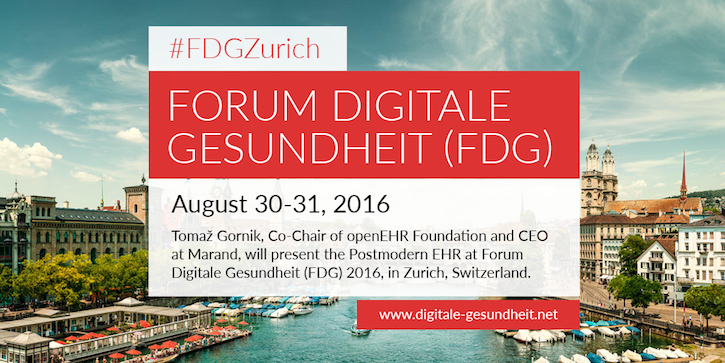 Tomaž Gornik, Co-Chair of openEHR Foundation and CEO at Better by Marand, will present the Postmodern EHR at Forum Digitale Gesundheit (FDG) 2016, in Zurich, Switzerland. Forum Digitale Gesundheit (FDG) – August 30-31, 2016, in Zurich, Switzerland - is a conference connecting the analog health system to the digital world by bringing together experts from both fields to discuss the latest trends and solutions in healthcare. Topics include the use of medical data for decision support and security, and interoperability of IT systems in a consumer-driven healthcare. With over 25 years of experience in domestic and international ICT markets Better by Marand has evolved into one of the market’s leading health IT solution providers. Our innovative products are all in line with the Postmodern EHR concept and fit perfectly with the spirit of the conference. Postmodern EHR is a multivendor environment built on an open and agile architecture, where introducing, upgrading and replacing apps, devices, and cloud services is easier and faster compared to legacy monolithic EHRs. A cornerstone to any Postmodern EHR architecture is a health data platform capable of managing data on behalf of all subsystems of the architecture. Better Platform™ is one of the leading health data platforms with major real-world implementations. Better Platform™ is based on open-sourced data models (openEHR) and supports agile development of innovative solutions. One such example is OPENeP - a medication management system built on Better Platform™ and supported by NHS England.